From April 8th to 12th, 2019, the 147 European Study Group with Industry will be held in Galicia, thanks to the collaboration between the Spanish Network for Mathematics & Industry (math-in) and the Technological Institute for Industrial Mathematics (ITMATI). Initiated in Oxford in 1968, the Study Groups with Industry bring together industrial scientists and academic mathematicians to work on problems affecting the industry. These Study Groups represent an internationally recognized method for technology and knowledge transfer between academic institutions and industry. stimulate greater awareness in community of the power of mathematics to provide solve real-world problems. 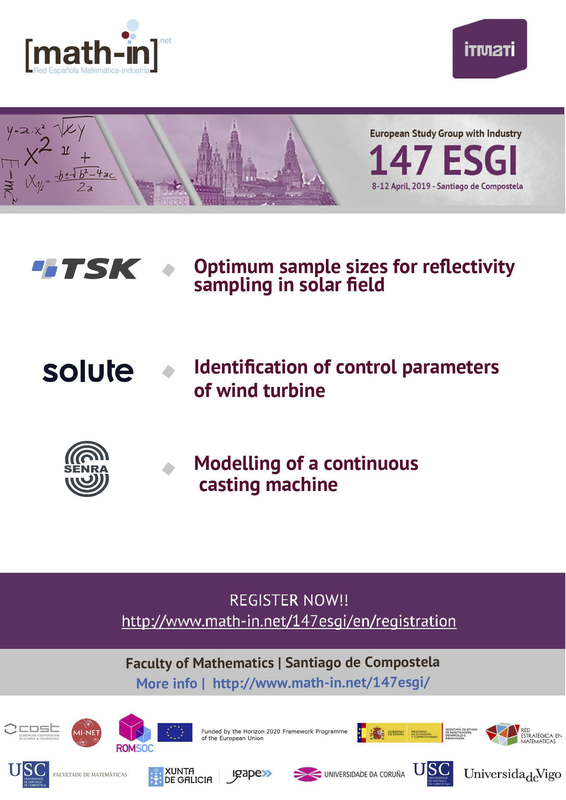 This 147 ESGI is a satellite meeting of ICIAM 2019 that will be held in July at Valencia, Spain. Organize: Spanish Network for Mathematics & Industry (math-in) and the Technological Institute for Industrial Mathematics (ITMATI). Co-organizes COST Action TD1409, Mathematics for Industry Network (MI-NET). COST Action TD1409, Mathematics for Industry Network (MI-NET) co-organizes and co-funds this event. ROMSOC project financed by the EU within the Horizon 2020 Research and Innovation Programme under the Marie-Skłodowska-Curie grant agreement No 765374.